The Lenovo ThinkServer RS160 is the ideal right-sized, value-priced, single-socket 1U rack solution for small and medium businesses that need optimized performance and flexibility for future growth. With support for a memory capacity of up to 64 GB and internal storage of 24 TB, the RS160 is ideal for small- to medium-sized business, workgroups, distributed locations, and webscale workloads. This guide is intended for technical specialists, sales specialists, sales engineers, IT architects, and other IT professionals who want to learn more about the RS160 and consider its use in IT solutions. This Product Guide describes models of the Lenovo ThinkServer RS160 with the Intel Xeon E3-1200 v5, Core i3 6100/6300, and Pentium G6100/6300 Series processors. For models of the Lenovo ThinkServer RS160 with the Intel Xeon E3-1200 v5/v6, Core i3 6100/6300/7100/7300, and Pentium G6100/6300/7100/7300 Series processors, see the following Product Guide: Lenovo ThinkServer RS160 (Intel Xeon E3-1200 v5/v6, Core i3, Pentium G Series Processors). The RS160 offers a wide range of processors - from Intel Pentium to Intel Xeon E3-1200 v5. Also, it features integrated NICs and an additional PCIe expansion slot for advanced RAID protection or network scalability. The ThinkServer Management Module (TMM), also known as Baseboard Management Controller (BMC), which is built into the RS160 offers advanced service-processor control, monitoring, and an alerting function. 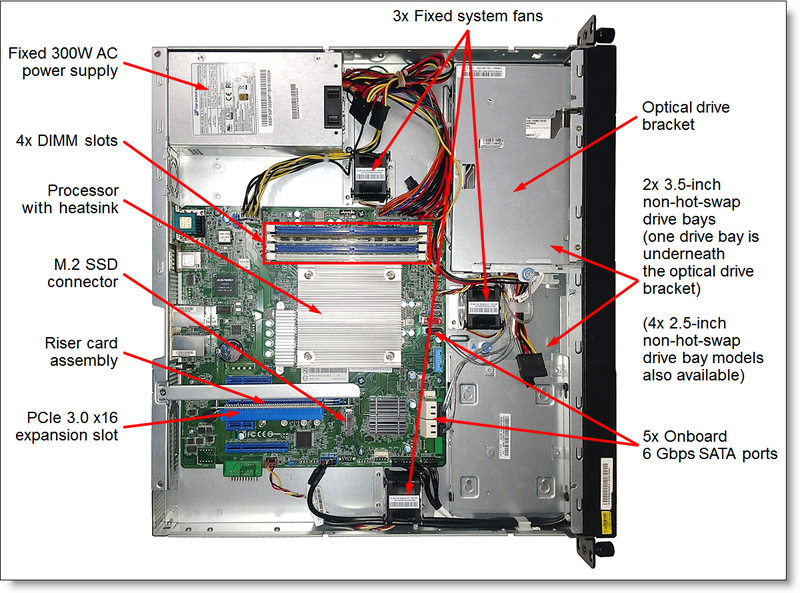 The following figure shows the Lenovo ThinkServer RS160. The RS160 offers enterprise-class management with an integrated ThinkServer Management Module. The RS160 has just a 16.2-inch (411 mm) deep chassis and supports 4-post and 2-post racks, giving you more flexibility with your business footprint. The RS160 offers energy efficiency and serviceability features, such as 80 PLUS Gold certified power supplies and sliding rails, that are not typically found in the single-socket value servers. The ThinkServer RS160 server is a compact, cost-effective, single-processor 1U rack server that has been optimized to provide enterprise-class features to small-to-medium-sized businesses, retail stores, or distributed enterprises. Intel Advanced Vector Extensions (AVX) technology significantly improves floating point performance for compute-intensive technical and scientific applications. Up to four 2133 MHz DDR4 ECC UDIMMs provide speed, availability, and a capacity of up to 64 GB. Two 3.5-inch or four 2.5-inch non-hot-swap (NHS) drive bays provide sufficient internal storage capacity in a compact 1U form factor. The RS160 supports UDIMM memory with ECC protection which provides error correction not available in PC-class "servers" that use parity memory. Avoiding system crashes (and data loss) due to soft memory errors means greater system uptime. Built-in ThinkServer Management Module (TMM) continuously monitors system parameters, triggers alerts, and performs recovery actions in case of failure, to minimize downtime. The server includes ThinkServer Management Module to monitor server availability and perform remote management. An optional Trusted Platform Module (TPM) enables advanced cryptographic functionality, such as digital signatures and remote attestation. Industry-standard Advanced Encryption Standard New Instructions (AES-NI) support improves the speed and strength of encryption. Intel Trusted Execution Technology provides enhanced security through hardware-based resistance to malicious software attacks. This enables an application to run in its own isolated space, protected from all other software running on a system. 80 PLUS Gold-certified power supply enables greater energy savings while providing flexibility to meet your business needs. Intel Intelligent Power Technology powers individual processor elements on and off as needed, to reduce power draw. The use of SSDs can help lower power consumption compared to traditional spinning 2.5-inch HDDs. The following figure shows the front of the RS160. The following figure shows the rear of the RS160. The following figure shows the internal components of the RS160. Intel Pentium processor G4400/G4500 product families with two cores up to 3.6 GHz, 3 MB cache, and up to 2133 MHz memory speed. Memory Four DIMM sockets. Support for ECC UDIMMs. DIMM speeds up to 2133 MHz. Memory capacity Up to 64 GB with four 16 GB UDIMMs. Memory protection Error-correcting code (ECC) memory. One internal M.2 SSD connector. Intermix of SAS and NL SATA HDDs and SSDs is supported within a system, but not within a RAID array. RAID 0, 1, 10, and 5 with RAID 121i. RAID 0, 1, 10 with RAID 520i. Optional RAID 5 upgrade. RAID 0, 1, 10, 5 with RAID 720i. Optical drive bays One. Support for DVD-ROM or DVD-RW. Two integrated GbE (10/100/1000 Mbps) RJ-45 ports (Intel I210). One GbE (10/100/1000 Mbps) RJ-45 port for systems management. I/O expansion slots Up to one PCIe 3.0 x16 (x16 wired) low-profile slot with an optional riser card. Front: 2x USB 2.0 ports. Rear: 4x USB 3.0 ports, 1x DB-15 VGA port, and 1x DB-9 serial port. Cooling Three fixed system fans. Power supply One fixed 300 W AC (100 - 240 V) power supply (80 PLUS Gold). Systems management UEFI, system LEDs, ThinkServer Management Module (TMM) (also known as Baseboard Management Controller [BMC]; based on ASPEED AST2400) with remote presence (graphics, keyboard and mouse, virtual media), ThinkServer EasyStartup, and ThinkServer Power Planner. Security features Power-on password, administrator's password. Optional Trusted Platform Module (TPM) version 1.2 or 2.0. Video Graphics with 16 MB memory integrated into the ThinkServer Management Module. Maximum resolution is 1920x1200 at 60 Hz. Operating systems Microsoft Windows Server 2012, 2012 R2, and 2016; Red Hat Enterprise Linux (RHEL) Server 6 and 7; SUSE Linux Enterprise Server (SLES) 11 and 12; VMware vSphere (ESXi) 6.0. Service and support Optional service upgrades (country-specific) are available through Lenovo Services offerings: 4-hour or 2-hour response time, warranty extension up to 5 years, Priority Technical Support, YourDrive YourData, and Enterprise Software Support. RS160 server models are country-specific; that is, each country may define their own server models, and not all server models are available in every country. For a list of the RS160 Relationship models (Machine Types 70TD and 70TF), contact a Lenovo or Lenovo Business Partner representative in your country. Product availability: RS160 server models are currently available in North America (NA); Latin America (LA); Europe, Middle East, and Africa (EMEA); and China. The RS160 server supports one processor. The following table lists the specifications of the processors that are available for the RS160. Note: The RS160 does not support Intel HD Graphics integrated into select processors. The server uses graphics integrated into the Baseboard Management Controller. The RS160 server has four DIMM slots, and it supports DDR4 UDIMMs with ECC memory protection. The processor has two memory channels and supports two DIMMs per channel. The RS160 server supports memory configurations with 1, 2, 3, or 4 UDIMMs. The RS160 server supports up to 2133 MHz memory speeds for one DIMM per channel and two DIMMs per channel configurations, provided that the processors support this memory speed (see the Processor options table in the Processors section for details). The following table summarizes memory speeds and capacities that are supported by the RS160 server. The following table lists the memory options that are available for the RS160 server. The RS160 server has one optical drive bay for an optional DVD-ROM or DVD-RW drive. The server also supports up to one internal M.2 SSD. The following table lists the internal RAID controllers and the additional options that are used for the internal drive storage of the RS160 server. The RAID 121i is an onboard RAID controller that does not consume a PCIe slot. The RAID 520i and RAID 720i adapters are supported only in the PCIe expansion slot provided by the optional PCIe riser card. * The RAID 121i is a hardware-assist, software RAID feature (Intel Rapid Storage Technology Enterprise [RSTe]) integrated into the Intel C232 Platform Controller Hub (PCH). ** Up to four ports are used for SATA HDDs or SSDs, and the remaining port is used for an optical drive. The following table lists supported combinations of the storage controllers and drive types for the RS160 drive bay configurations. The RS160 server supports the drive options that are listed in the following tables. The RS160 server supports optical drive options listed in the following table. The Slim SATA DVD-RW Optical Disk Drive supports the following types of media: CD-R, CD-ROM, CD-RW, DVD-R, DVD-R (dual-layer recording), DVD-RW, DVD+R, DVD+R (dual-layer recording), and DVD+RW. The Slim SATA DVD-ROM Optical Disk Drive supports the following types of media: CD-R, CD-ROM, DVD-R, DVD-R (dual-layer recording), DVD+R, DVD+R (dual-layer recording). The following table lists the riser card option supported by the RS160. The following table lists the network adapter options for the RS160 server. The following table lists the RAID adapter and HBA options that can be used for external storage attachments. The following table summarizes features of supported SAS storage controllers. The following table lists Fibre Channel host bus adapters (HBAs) supported by the RS160 server. The RS160 server offers optional hardware security modules listed in the following table. The RS160 server supports one 300 W AC fixed power supply. The power supply is 80 PLUS Gold certified. The following table lists rack power cables and country-specific line cords that can be ordered with the RS160. Important: VMware ESXi support requires an Intel Xeon E3-1200 v5 processor and a PCIe RAID adapter. The onboard RAID 121i controller is not supported by VMware ESXi. The RS160 server contains ThinkServer Management Module (TMM), which provides advanced service-processor control, monitoring, and an alerting function. If an environmental condition exceeds a threshold or if a system component fails, the TMM lights LEDs to help you diagnose the problem, records the error in the event log, and alerts you to the problem. As a standard feature, the TMM also provides virtual presence for remote server management capabilities. The following table lists the rack installation options that are available for the RS160 server. * Measured when mounted on the rack, from the front surface of the front mounting flange to the rear most point of the rail. Note: Threaded mounting holes are not supported. The RS160 has a one-year or three-year customer-replaceable unit (CRU) and onsite (for field-replaceable units [FRUs] only) limited warranty with standard call center support during normal business hours and 9x5 Next Business Day Parts Delivered. Also available are Lenovo Services warranty maintenance upgrades and post-warranty maintenance agreements, with a well-defined scope of services, including service hours, response time, term of service, and service agreement terms and conditions. Onsite Service If a problem with your product cannot be resolved via telephone, a Service Technician will be dispatched to arrive at your location. Parts Delivered If a problem with your product cannot be resolved via telephone and a CRU part is required, Lenovo will send a replacement CRU to arrive at your location. If a problem with your product cannot be resolved via telephone and a FRU part is required, a Service Technician will be dispatched to arrive at your location. Response time target 2 hours, 4 hours, or Next Business Day: The time period from when the telephone based troubleshooting is completed and logged, to the delivery of the CRU or arrival of a Service Technician and part at the Customer’s location for repair. Committed Repair 6 hours or 24 hours: The time period between the service request registration in Lenovo’s call management system and the restoration of the product to conformance with its specification by a Service Technician. Lenovo’s Hardware Support Preferred Access offering enhances our award-winning call center support to provide top priority queue assignment to specialized Lenovo technicians. Priority support accelerates call center troubleshooting to get your problems resolved quickly, and includes other value-added support for Lenovo provided software tools. Priority support can be purchased stand alone to match the base warranty of your system or in convenient bundles with our same-day response services. The following table lists the relationship models of the 12 Gbps SAS external drive enclosures that are offered by Lenovo that can be used with the ThinkServer RS160 for storage expansion. The following table lists the TopSeller models of the 12 Gbps SAS external drive enclosures that are offered by Lenovo that can be used with the ThinkServer RS160 for storage expansion. The following table lists the external storage systems that are offered by Lenovo that can be used in RS160 solutions. The following table lists the backup units that are offered by Lenovo that can be used in RS160 solutions. The following table lists the top-of-rack Ethernet switches that are offered by Lenovo that can be used in RS160 solutions. The following table lists currently available Fibre Channel SAN switches that are offered by Lenovo that can be used with the RS160 in IT solutions. The following table lists the rack cabinets that are offered by Lenovo that can be used in RS160 solutions. The following table lists the console switches and monitor kits that are available from Lenovo that can be used in RS160 solutions. The following table lists the power distribution units (PDUs) that are offered by Lenovo that can be used in RS160 solutions. The following table lists the uninterruptible power supply (UPS) units that are offered by Lenovo that can be used in RS160 solutions. Intel Core™, Intel®, Pentium®, and Xeon® are trademarks or registered trademarks of Intel Corporation or its subsidiaries in the United States and other countries.